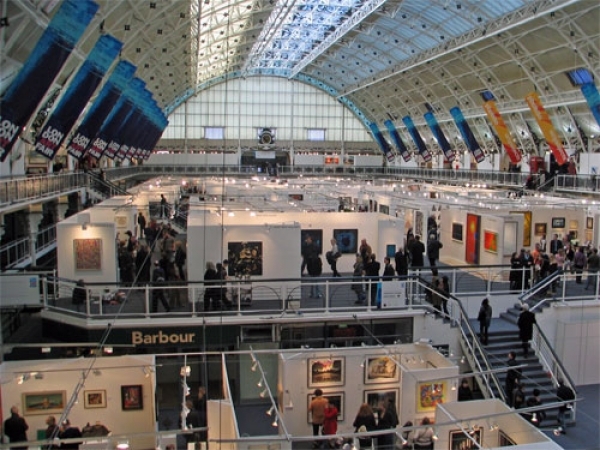 The London Art Fair opened its biggest show to date on Wednesday with over 100 galleries, many featuring exhibits inspired by contemporary themes like economic hardship and civil unrest. Other highlights of the exhibition of paintings, sculpture and photography include a contemporary photography showcase and provocative installations from a Glaswegian art collective. "This year is our largest Fair to date," said director Jonathan Burton in a statement. "Modern British painting and sculpture are at the heart of London Art Fair, but our thriving contemporary strand has grown with a number of galleries exhibiting at the Fair for the first time, including Danielle Arnaud, Vegas Gallery, and BARTHA CONTEMPORARY."